Klamath Falls Urban Trail Master Plan | Kittelson & Associates, Inc.
Klamath Falls is completing an Urban Trail Master Plan to identify improvements at key gaps in its trail network. Gaps and deficiencies were identified during earlier stages of the project, and a draft set of projects has been developed. 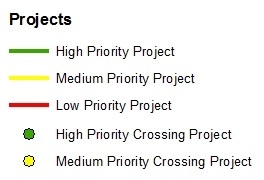 Use the map at the right to tell us if you agree with the recommended project and priority. For more information on the Plan development, please visit the Plan's website. Having trouble viewing or using the map? Please contact Ashleigh Griffin at agriffin@kittelson.com with your comments.